I adore beautiful architecture, whether it is new or old - a good design never disappoints. The same goes for jewelry. 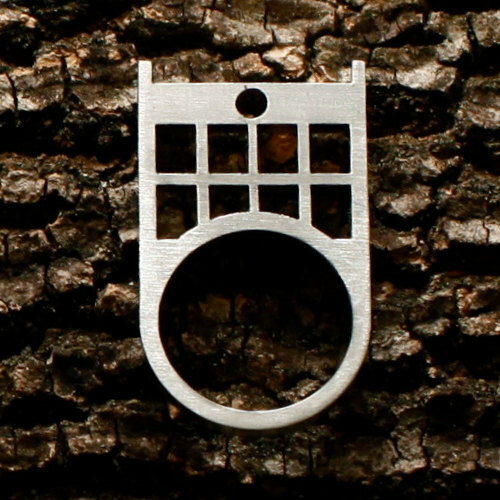 But, what about architecture-inspired jewelry? 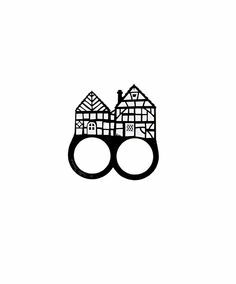 Beauty is beauty, I say and today I am bringing you some of my favorite quirky jewelry that falls under the architecture theme. There is definitely something here for everyone, even those who lean towards minimalist over the slightly odd. I, personally, want one of everything on this list and I hope you do too. I adore Tatty Devine. They actually led me down my path to quirky, British jewelry designers. Their styles are whimsical, unique, and never cease to make me smile. They are also, from my personal experience, well made. 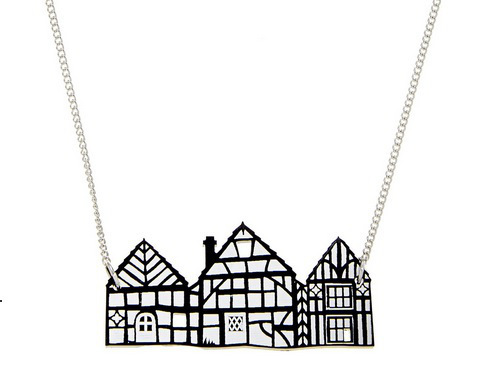 Their line of Tudor-esque jewelry is no exception. The line comes in both house-base structure and statement pieces with earrings, rings, brooches, and necklaces to choose from to bring a bit of the past into every day life. I featured a piece by Kate Rowland before - a cardigan clip to be exact. She is one of those quirky British Jewelry designers I love. 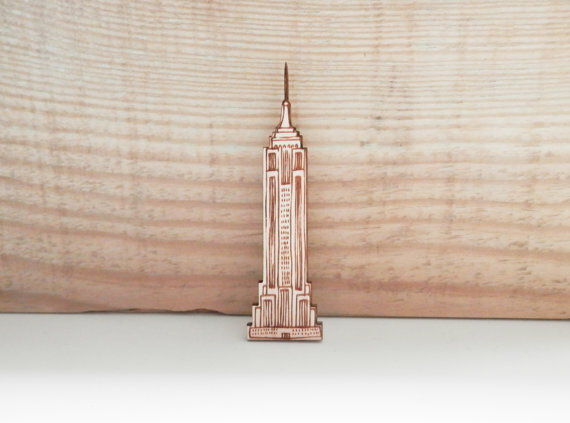 Today, I want to share with you two of her wood engraved brooches - a little "Big House" and the Empire State Building. Like all of her work, I find them utterly charming. The perfect adornment for any occasion. Looking for a more continental style of architecture? 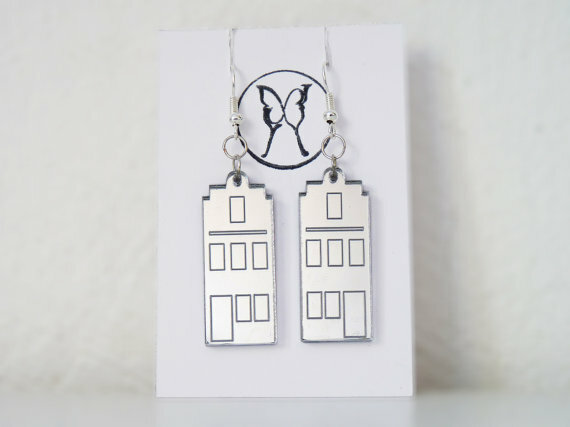 These laser cut earrings are made from mirror plexiglass to represent the beautiful Amsterdam canal houses. Each design has slightly different windows, but equally darling. If you are looking for some iconic architecture, may I suggest the creations form Freeform Ind (they also have an Etsy shop, but the images below are linked to their site). From the Golden Gate Bridge to the Gherkin, they have a variety of buildings and bridges (not to mention maps, subway trains, and even industrial equipment) to choose from and most come in a choice of color / material. If you prefer rings over earrings and necklaces, then this line is definitely for you. Part of Days of August's Home Sweet Home Collection, these rings are made from an industrial stainless steel offcut, which is then hand polished to a brushed finish. 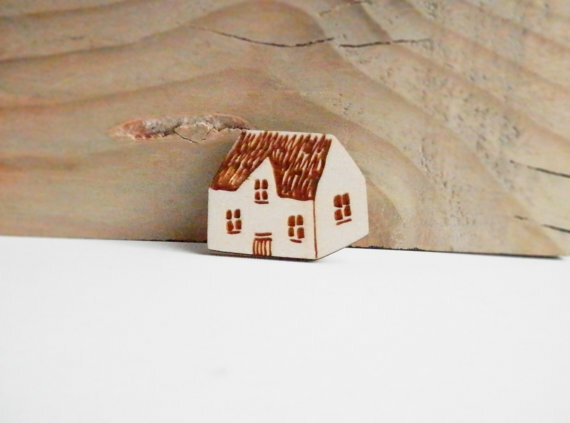 They come in three styles: The House (because 'There's no place like home", The Cottage (inspired by old fashion stone country house found in rural Canada - 'La Canadienne') and The Loft (inspired by all the old warehouses converted into beautiful homes). 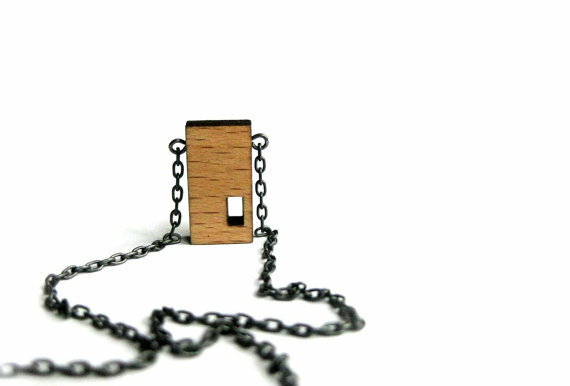 For those who prefer a minimalist style, you may prefer these tiny wood punchout necklaces. One reminds me of a simple, modernist home, where the other recalls skyscrapers or an multistory apartment building. Her shop says the "series captures the essence of architectural facades; the substance that separates inside from outside." I swoon over Art Deco architecture. I have even taken Art Deco architecture tours. Therefore, you know I adore these two pieces by minusOne. Both the earrings and the bracelet are inspired by New York's Chrysler building. Both are simple, sleek, and definitely reflect the style and era of the building. Perfect for your roaring '20s party or pairs simply with your favorite pair of jeans for a little dash of glamour.